However, I can now happily say that I’ve meditated consistently for years and enjoy the fruits of that practice, from greater peace and balance in my daily life to improved patience with my family (among other things). Next week, I’ll be sharing a free video series on this very topic. 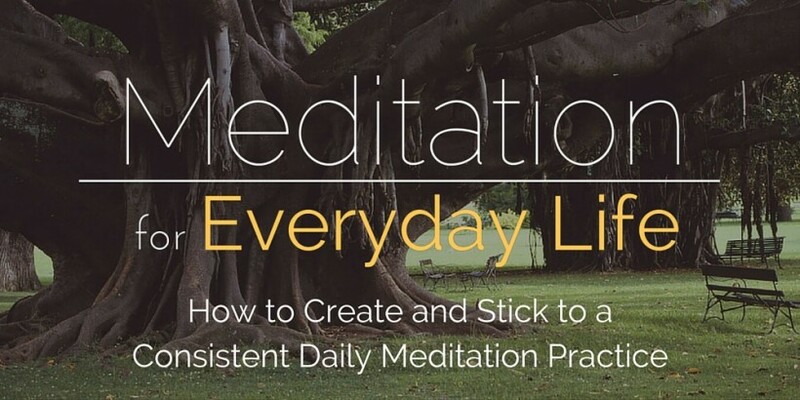 It will show you how to find the time to practice, how to stick to a consistent daily practice, and how to overcome the challenges we’re faced with in everyday life to live more mindfully and meditatively. It’s a common misconception that you have to meditate for some great length of time, such as 20 or 30 minutes. The truth is, even 5 minutes of meditation is highly effective and all you need to begin establishing meditation as a consistent practice. The reality is, when trying to adopt a new habit or make some sort of positive change, we need give ourselves every advantage possible. A whole host of things will attempt to keep us from making that activity or behavior a regular part of our lives and we’ll give ourselves every excuse as to why we can’t do it, so you need to make the activity as simple, easy, and convenient as humanly possible. By meditating for, say, 5 minutes for the first few weeks of your practice, you’ll have established a strong foundation with which to build from. You can then begin to increase your sessions from there to 10, 15, 20 minutes and longer (whatever you choose). This is a simple and, for the most part, easy point (the setting of it is easy, sticking to it often isn’t), but I’ve found that it’s something most people don’t consider when attempting to make meditation a daily habit. Virtually all of the most important activities in your life are scheduled. Think about it: meal time, work, time with family, important meetings and errands, time out with friends, kids activities, and just about everything else is scheduled. In order to make something a part of your life long-term, you need to make it a part of your schedule. It’s easy at first to get the idea that you can only meditate while sitting in a specific way, with your eyes closed, on a cushion. However, you can practice mindfulness anywhere, while doing anything, and at any time. Also, it’s important to note that you don’t need some specific environment or set up to practice mindfulness. Sure, these things can help, but they're not necessary. First, you don’t have to do something more slowly to do it mindfully. In the beginning, this may be beneficial or even necessary to learn the practice, but once you get the hang of it you can walk at your normal pace mindfully. Secondly, you can practice mindfulness in a crowded area. The only caveat to that is the voices need to be indiscernible. By that I mean if you can clearly make out a conversation nearby you’ll be likely to lose your concentration. If you can’t make out the words, the jumbled sound creates a consistent backdrop, which is easy to concentrate amid. We all know (or at least believe) it’s best to do something consistently for a long stretch of time, because then you’re more likely to make it a habit or a more “automatic” behavior. However, exactly how that affects meditation practice hasn’t always been so clear. Coach.me, the goal-tracking app, reviewed data from users who participated in a meditation course and found that meditators who practiced for just 11 days were over 90% more likely to continue in their practice from the 12th day and on. So, create a streak of at least 11 days straight and you’ll give yourself a strong advantage to making meditation a regular part of your life. The reality is, if you want to stick to a consistent meditation practice, you need to be flexible. Somedays, things will come up and block you from either meditating during your regular scheduled session, or, from meditating as long as you usually do. When this happens, just adapt and roll with it. If you’re short on time (actually short on time, not just convincing yourself you are), meditate for 5-10 minutes instead of your usual 20 minute session. Whatever you do, the most important thing is that you get yourself on the cushion, even if for only a few minutes. That’s a huge part of creating a consistent meditation practice. Something interesting happens when we start meditating: we come face-to-face with the mind. However, for most of us, it’s not a joyous occasion (at least at first). That’s because, for most of us, all we find is utter chaos. And as a result of coming face-to-face with the chaos of our mind, we learn that we’re naturally very, very critical of ourselves. Everyone goes through this and you’re not adverse to meditation. This is perfectly natural. Being with the mind as it is, without judgment, is what the practice is all about (whether that’s chaos or calm) and it’s how the practice is supposed to be. More than being at peace, mindfulness meditation is about being with the mind in whatever state that might be. One day you might feel relative peace, another day might be sheer chaos. However, your approach to both meditation sessions is the same: be with the mind mindfully and nonjudgmentally, fully accepting of whatever thoughts, feelings, and sensations arise. This is how, with time, you learn to make friends with your critical mind. When it comes down to it, motivation is mostly just a measure of how aware we are of our reasons for taking a particular action (and the emotional intensity of those reasons). Make no mistake, motivation is a critical part of sticking to a daily meditation practice. By identifying clearly what drew you to meditation as well as what meditation practice has done (or is doing) for you, you’ll be far more motivated to continue sitting in meditation. Get clear on why you meditate and make sure those reasons are emotionally compelling. Once you’ve done this, keep these reasons top-of-mind to begin to draw that mental connection between your practice and these compelling reasons. This is absolutely one of the most powerful things you can do to stick to a more consistent meditation practice. Most of us go into meditation practice with certain expectations. We want to levitate by one year, achieve nirvana and self-combust, or become enlightened and live off the dew of a single ginko leaf and the energy of the universe (yes, that’s a Kung Fu Panda reference- they’re my kid's favorite movies). Jokes aside, often these expectations are attached to our reasons for practicing. However, they don’t have to be and aren’t the same thing. One can be utilized positively while the other is generally a hindrance to practice. Expectations are dangerous because it causes us to judge our meditation sessions and gauge whether or not we’re “progressing” at the speed, or in the way, we believe we should be progressing at. This is the worst approach to take with meditation practice because it amplifies the already difficult to handle critical mind and makes it seemingly insurmountable, at least until you let go of those expectations. And really, it’s against the practice of "accepting the moment for what it is” entirely. You may have come to meditation practice for a reason, but it doesn’t mean you need to expect anything in particular, in a particular amount, or in a particular amount of time in connection with that reason. It may take practice, but you can cultivate a “no expectations” state of mind when sitting in meditation (and outside your meditation practice) by allowing yourself to relax and sit with whatever comes to you, openly accepting the meditation session as it is, and letting go of the desire for anything more than what is now in this moment. Meditation isn’t a prescription you pick up and use to cure some condition, henceforth being freed from said condition and no longer in need of meditation. Meditation helps us cultivate important qualities such as peace, balance, and a sense of space and work through many big challenges, which gives the practice a real sense of progression. However, the journey never really ends because you need to continue to meditate to maintain those various qualities and benefits. Instead of looking at meditation as some new positive habit you want to adopt to help cure something such as stress or anxiety, to make meditation a consistent daily practice and maintain these benefits you need throw out the idea of an “end point” and just decide to make meditation a part of your life long-term. By the way, doing so really helps remove expectations. This is because, by shifting your mindset for the long-term, you stop thinking so much about “when am I going to get to X point?” and can simply enjoy your practice more. Meditation is a beautiful practice, one which comes with numerous significant and potentially life-changing benefits, so make it part of your life and simply sit enjoying this beautiful practice. Accountability is key to creating any new habit and meditation is no different. In the case of meditation, accountability to yourself can be done via a simple session tracking sheet in Microsoft Excel, Google Docs, or some similar program or even a simple sheet of paper. Accountability to others can be a simple line of communication between two or more people over email or in person that each person reports to daily to confirm whether they meditated or not. Why is accountability such an effective tool for sticking to new habits? Accountability works off of the basic set of pain and pleasure motivators which control many of our actions in our daily life already. By either being accountable to yourself or (especially) accountable to others, a pleasurable feeling develops in connection with the idea of completing the task and a painful feeling in connection with the idea of not completing the task. This alone can sometimes be all that’s needed to help someone develop a new habit because the potential for pain is such a strong emotional motivator. This might seem like a simple or rather obvious tip, however, it seems like a lot of people eventually forget that you should enjoy your practice. This is an important part of the Buddha's advice for walking the path of awakening (whatever you personally consider that to be). That is, walking the journey in an easeful and joy-filled way. If at any point you feel your practice has become a chore, you can be sure you'll drop off soon afterward. It's just the way that it works. You should enjoy your practice, for the most part. If you get to a point where you do feel like your practice has become difficult or cumbersome, and not because you're sitting through an internal challenge but rather because you've just gotten bored or tired of it in some way, switch it up and try something unique like mindful walking, mindful driving, or mindful cleaning (assuming your core practice is sitting in meditation) or an entirely different meditation technique like loving-kindness meditation. If you're feeling brave or up to the challenge, this boredom or frustration is also something beneficial to sit with. When you feel it arise, sit down and notice the feeling, and whatever arises along with it, a few times before getting up. Doing so will help you bring clarity to what's going on. The challenges that face us in sticking to a daily meditation practice consistently are numerous and varied. However, we also have numerous tools which we can utilize to work through these challenges. With the proper motivation and the right tools in hand, you can make meditation a daily habit.